How's your summer going? Ours has been crazy busy but that is nothing new around these parts. This is the first summer I have taken classes (and hopefully the last!) and trying to juggle life, the kids, and of course their extra curricular activities - all while trying to keep my sanity and stay cool in the Texas heat! So I blame college, but this season of my life I have read more books than I probably have in my entire life. Yes, I'm ashamed, I have never been a big reader, but my love of books has really developed and I hope it's here to stay. 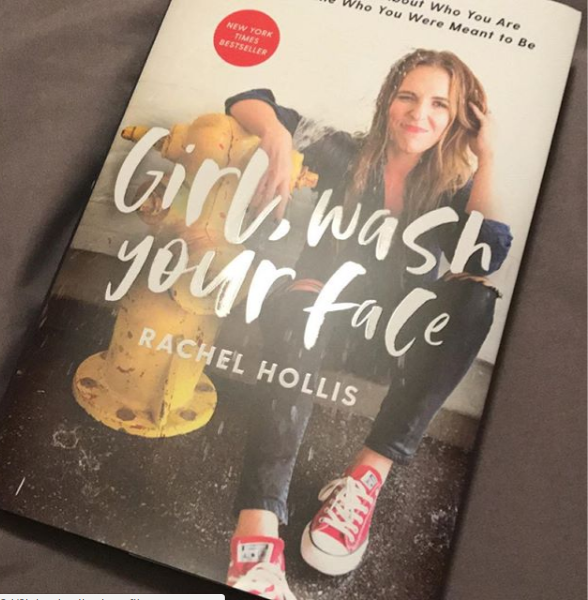 With that being said, Have you read Girl, wash your face yet? I'm a little late to jump on the band wagon, but oh my gosh, this book is seriously so good. So good, I couldn't even put it down! You are never to old to start a new goal or dream up a new dream. I remember when I first started this blog, almost eight years ago, I always wanted to write and share my voice, but I guess there was always this fear of other people's thoughts or if anyone would even really read it. I can happily say I've partnered with the most amazing companies, developed friendships with fellow bloggers and have over 40,000 combined social media followers (which is huge for me!). I love Rachel's book, it was literally like someone flipped on the light switch - this is the book you've been waiting for. This time in your life, right here, right know, this is it. The timing couldn't be more perfect. I've worked hard to get where I'm at, sure I've struggled, (a lot actually if we are being honest), but I'm not finished. This isn't where I want to be, my story isn't over yet (and neither is yours!). I'm in college to obtain my teaching degree in special education, I want to build a better future for my children and even buy a beautiful home with a large backyard but more importantly I'll be doing what I love to do. Those are just some of my goals and dreams, but I am taking the steps needed every.single.day to make them a reality, and that's what counts. I've always wanted to teach, I come from a family of passionate teachers, so last year I hit the ground running. Made the life changing decision to return to college and I've enjoyed every second of it. Well except for Algebra, but seriously who uses y=mx+whatever on a daily basis? Anyways, I knew from very young that I was made for more, that I had a calling or passion - I just didn't always know what it was. I remember getting in trouble in school as a young child for talking, and my Mother used to tell me, one day that voice will come in handy. Boy has it ever, (of course Mother was right) as an adult and parent, I use my voice to advocate for my son and Autism, raise my children, speak my mind and as a blogger, I use it to write, and hopefully educate and inspire. Hopefully as a future educator, I will be able to use my knowledge and voice even more to help children and families. Whatever feeds your soul you should do it, don't let the what if's and the maybe I'll start tomorrow's hold you back from pursuing and achieving your goals and dreams. This is your life, your journey and your happiness, what goals and dreams do you have? Dream big or dream small, just DREAM! Write them down, hang them on the fridge and then figure out what steps are needed next to accomplish them and go tackle them, hit the ground running. You can do this, your time is now.